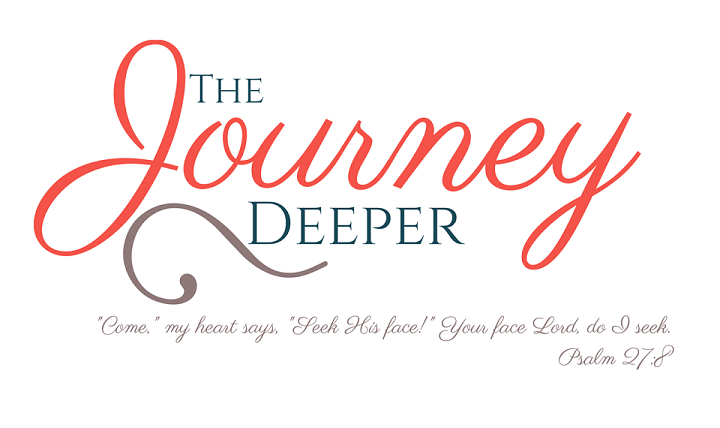 The Journey Deeper: The Church: Moral Voice or Hospital? 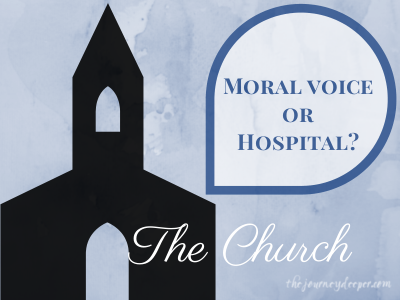 The Church: Moral Voice or Hospital? Should the church operate more as the voice of morality in society, or as a hospital for the wounded? I responded to him saying that those were not mutually exclusive. The point of his question, however, was from the perspective of church programming and focus. After much thought, I have two answers to this question: both, and neither. Similarly, as a standard, serving others should be a priority. The "fast" that we choose, the way we show our dedication to our God, is serving the least of these: the widow the orphan, the neediest in our society. It is sitting with the sinner, binding up the brokenhearted, and freedom for the captive. It is praying for the broken, feeding the hungry, healing the sick, weeping with those who mourn. These are the ones that we are called to serve. (Isaiah 58:6-9, Isaiah 61:1-3, Matthew 10:40-42, Matthew 25:31-46.) In addition, all the "sick" in our society should be welcomed within the Church, and should be able to seek God for hope and healing, while their wounds are tended by its members. The Church is a community before it is a corporation. In its most basic form, the Church was a gathering place for believers. They would fellowship with each other, build each other up, hold each other accountable, and grow together (Ecclesiastes 4:9-12, 1 Corinthians 12:12-30, Galatians 6:1-2, James 5:16, Hebrews 10:25). The first church, in Acts 2, went as far as to live together! The point is, the Church was a community dedicated to the well-being of each of its members (1 Peter 2:1-5). Without this nourishment and development of the individual within the corporate setting, the Church can function neither as a voice of morality nor as a hospital for the wounded. Thus as the Church, our primary focus should be our growth as followers of Christ, and in so doing inviting others into membership of Christ's body. If we focus on either of these two (voice or hospital), without being built on the aforementioned growth, we run the risk of not being able to do any of these three things. I believe that it is only through maturing as we walk with Jesus that we can be most effective as a voice, or as a hospital. Why? Because it is in the heart and the nature of the healthy, mature believer to be the light and the standard, and to heal the wounded of our society (Romans 12:9-21, Colossians 1:9-11). And without this maturity, or at least, a place to mature, we run the risk of being a Pharisaical voice, dictating stringent rules to all around us, or a hospital where the staff are so sick that they are infecting the patients. The Church should be a place that people look to as a standard, and a place for broken people to come to be made whole, not because of what we do, but because Jesus is there. These are my personal views on this question. What are your thoughts on this? I'm very interested in hearing which of the four possible answers to this question you'd choose. Be blessed and shine from the heart! Great response! You've covered a lot of angles. Basically the church has responsibilities both externally and internally. You have hit on something important in your answer under "why neither." Christianity is always an inside-out process. A Christian life begins with an internal work of the Holy Spirit, regenerating and shaping a person to look like Christ; that then comes out of the person in external good works. The same is true of the church: a community is developed and shaped internally through the work of the Spirit. That God-motivated church is then moved externally into good works by God's power, creating a beacon of light in a dark world. A church should be developed and matured, dedicated to the "well-being of each of it's members." As that happens, it moves into the "why both": a church that holds to the biblical standard of love and service. Enjoyed the article very much :) Thank you! Exactly! We must first take care of the soul of the Body, before we worry about being able to be the standard for other bodies and souls.